Story of Smallpox [Hosotan] is one of the Twenty-Seven Nights for Four Seasons[Shiki no tame no niju-nana ban] that was presented in autumn 1972, after his 4-year silence since Revolt of the Body [Nikutai no Hanran] in 1968. It was a monumental piece with drastic conversion from butoh in the 60s in its philosophy, style, method, expression and casting. It gave an irreversible turn to butoh and significantly influenced the next generation. This film is the only complete recording of a performance with Hijikata on stage. A compilation of six short films on Kazuo Ohno’s activities from 2000, when he notably lost his stamina, to his 103rd birthday in 2009 including his last solo performance Hana [Flower] in 2001. A documentary film by a talented filmmaker Kouki Tange that captured dance language flowing out from Kazuo Ohno’s body through depicting his quiet daily life in his private room and studio in 2006, when he accomplished the age of 100. A filmic gem featuring Kazuo Ohno by Daniel Schmid, who was known for his decadent aesthetics. 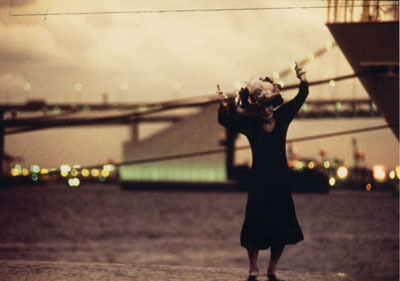 The visional scene in which he dances at the Port of Tokyo in the dusk is bound to be long remembered as the most beautiful dance image of Kazuo Ohno. HASHIGO means “hopping”!!! You can have fun all night long with bar-hopping!! Dance in the cafe´! Dance in the club! Dance in the museum! Dance on the roadside! Let’s try HASHIGO party??? And dance with faifai??? 23:00 Tadasu Takamine Melody Cup Team(Toru Yamanaka. ex dumbtype) DJ Time Start! Copyright.TPAM in Yokohama. All rights reserved.